But what about when they get a little older? You’d think you’d get a bit of a clearer image of how things are going to be. Growing up my mum was a really involved school mum. She volunteered at the canteen, she helped with the school gardening – she even mowed the school lawns! School art projects – she was there to lend a hand. School excursions – she was first on the bus. Parent helper needed in the classroom – she was there! Costumes need sewing for a school play – done. Parent Committee – of course she was all over that! On some subconscious level I’d assumed that would be what being a school mum looked like for me. I’d be a super involved helpful parent. I’m pretty crafty, I like being helpful, I studied teaching for a year so I assumed I’d be the first to put my hand up as a classroom helper. I imagined I’d be an organised and shining example of what it is to be a “School Mum”. We’ve become very close over these last few years. Oh I wasn’t joking though. I had no idea who my kid’s teacher was. My child meets me at the playground. I don’t go to his classroom! I have since met her… it’s okay. Parent teacher interviews cleared that up. I actually met her before the interview though because I forgot to take back the form to organise a time for said interview, so I had to go into his classroom to arrange a time to meet her…. so it all worked out in the end! On the plus side the Parents and Friends committee have stopped asking me to join. Or volunteer. Or bring things. I do however bring a plate for Harmony Day – where we’re asked to bring a dish from our culture. The first year I tried to make falafels from scratch because at the time I still was under the impression that I was the kind of mum who’d bring homemade falafels to Harmony Day, because while it’s not a food from my culture, it’s my kid’s paternal grandparents… so… that’s something I would do. Right? Next year I’ll probably just buy a packet of lamingtons and be done with it. And to be honest, even though I do wish I could remember to bring forms back on time – I do actually like the school mum that I am. I don’t have to say “yes” to everything. I don’t need to be and do all the things. This is who I am and it’s okay. I get my kid’s to school (more or less) on time every day, and pick them up, and pack them a lunch every day with only a couple of exceptions where I had to race home and back to fetch it! And they’re always in a (moderately) clean school uniform*! What more do I really NEED to be to be a good school mum? Even if I’m not the school mum I thought I’d be. But one thing I have learned as a parent is nothing pans out the way I’d planned it. So, for the record, I’m surrendering any ideas I think have about how I plan to raise teenagers. Because I now know I literally have no idea what the next stage of parenting will bring. Have you been the parent you thought you’d been or have you deviated from the plan a little? *Actually on the topic of school uniforms, does anyone have any tips for getting those bloody things clean? Fairy bread!! You must have been the star of the show! 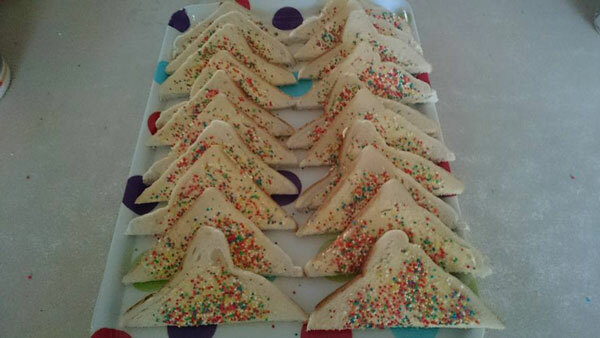 I love fairy bread. I do too. It’s so good. ? apparently it was well received by the kids.